Among the many things I enjoy about living in a city like New York is the food – not only do we have an incredible array of ethnic restaurants (as Lewis Black stated on his anti-Texas rant, “Chinese! Italian! Bhutanese – hey Texas, can you spell Bhutanese?”), but we can easily find the ingredients to make pretty much whatever we want without much effort – which is certainly not true in other parts of the country. A few years ago, Renata and I spent a few days in Myrtle Beach, SC and headed to the local supermarket in order to buy supplies. Since our resort there had a fully equipped kitchen, we went the local supermarket to buy some supplies so I could cook instead of going to restaurants every night. I wanted to make arroz con pollo, a simple enough dish that is basically chicken cooked with Arborio rice, chorizo, diced tomatoes, garlic, onions and saffron. The first roadblock I hit was chorizo (spicy Spanish sausage) – the place didn’t even have a Latin section (mind you, this was a major supermarket, not a small grocery store) to begin with. I was eventually able to find Andouille sausage, which is a good enough substitute even though the fat content is a little too high in comparison. When I asked the employee for the kind of rice I needed, I got a puzzled face in response, so I just went with long grain because they had nothing else. I also wanted some dill to make baked Polish fish but they only had the dried variety, not fresh. In the end, I had to adapt every single recipe I had in mind because I simply could not find everything I needed. You might think that this would have been due to the fact that this was a southern town with little immigrant presence, but while there I met people from various countries – including India, China and Vietnam, but there was no reminder of that in any of the food markets around us. 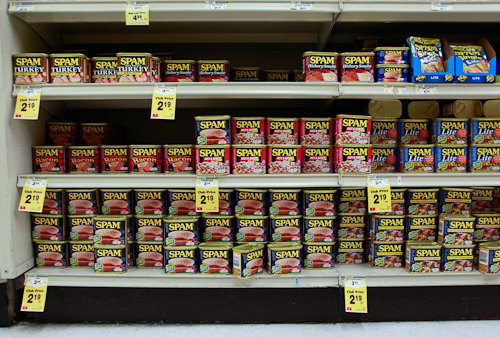 It was not that different in Honolulu either – although there were plenty of Asian products (rice was definitely not an issue there – I could choose from pretty much any variety I wanted), there was little else in terms of food diversity – not even the Goya canned products you find in any grocery store in town – except if I wanted to try some new variety of SPAM that is unavailable anywhere else. Here in New York it’s a completely different story – even if your local supermarket won’t carry a certain product, you can easily go to a different neighborhood and voila – you get what you need. I remember a few weeks back I wanted to make koftas and of course no market in my neighborhood carried the main ingredient, which is chickpea flour. All I had to do was make a stop around E6th Street on my back from work and there were plenty of Indian stores that carried it – I had what I needed within minutes. Of course, there are many things that discourage me about this town from time to time, such as the long winters, but just to know that a world of flavors is within walking distance makes me realize how happy I feel to live in this town. 1. Melt the butter in a large skillet over medium heat. Sauté the ham, onions and pineapple chunks in the butter for about 5 minutes. 2. In a separate medium bowl, combine the pineapple juice, vinegar, brown sugar, mustard and cornstarch. Stir this together well and pour over the ham mixture in the skillet. Stir well and allow heating through and thickening, about 5 minutes.